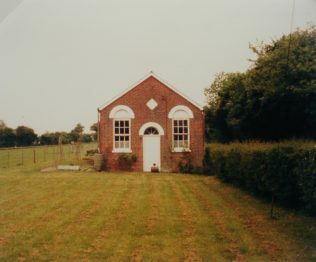 The plaque on the building in Keith Guyler’s photograph reads “Primitive Methodist Chapel 1861”. It is located on Baybridge Lane. The hamlet of Baybridge lies about a mile, as the cow flies, south-east of Owslebury village in Hampshire. At the start of the 20th century it consisted of a small group of cottages, a Primitive Methodist chapel, and the farm-houses and out-buildings of Baybridge and Lower Whiteflood Farms. The chapel closed in 1962. At the time of the photograph in 1988 Mr Guyler’s notes say it was in use as a private garage. On Google Street View in July 2011 it looks much more like a house.